Good: Running and gunning is fun. Bad: Textures pop in is quite frequent. 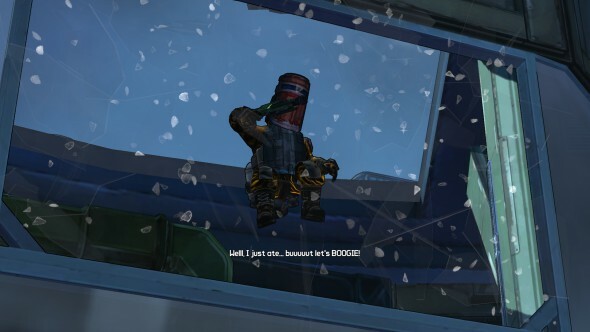 Borderlands: The pre-sequel is the installment that is the bridge between Borderlands and Borderlands 2. When every game developer have their eyes set on the current generation consoles, 2K and Gearbox have designed this game for the previous generation. The release being on PS3, OS X, PC, and Xbox 360. The emphasis is still on the run and gun, shoot and loot gameplay, which this series is known for. A few additions have been added to the gameplay, like a buttslam and new elemental effects on guns. This all benefits the already solid gameplay. Just like in the previous 2 games, you are one of four mercenaries. However, this time the search is not for the Vaults, but you have been hired by a man called Handsome Jack. Helios Spacestation has been overrun by pirates and it’s up to you to help Jack take back control and save Elpis, Pandora’s moon. If you’ve played Borderlands 2 before you set off on this adventure, you’ll notice that Handsome Jack is actually a quite likeable fellow. Make no mistake, he knows what he wants and he’ll get it at all costs. As you play the game you’ll get a lot of background information about all the NPC’s in the game. There’s a lot of story to entertain you and Borderlands’ trademark is to underline the gravity of a situation with a smirk. The game toys with your emotions. The NPC’s seem all funny and happy when they tell their stories, but when the punchline comes you’ll feel sad as you’ve just laughed over someone who has just lost their lover or something else equally excrutiating has happened to them. The story has a better flow than the previous titles. They’ve worked on the exposition and you’ll feel more immersed because of it. You’ll actually feel like you’re part of the action instead of being minutes to late to the party. 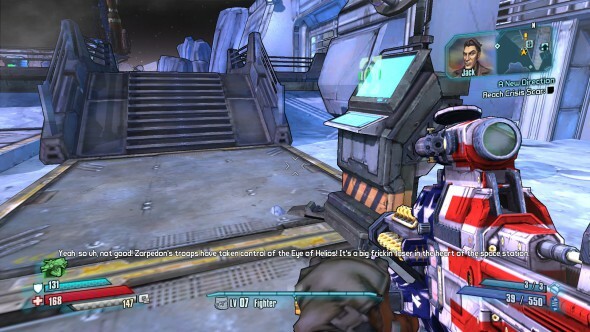 Cell-shaded graphics are Borderlands’ strong points and this installment doesn’t break away from the tradition. For some reason the game felt less finished than Borderlands 2. The textures seemed bland and pop-in often occurred. The game hasn’t really moved past its predecessors graphics wise, which isn’t necessarily a bad thing. Why fix what isn’t broken? You can change the appearance of your hero, but as this is a first person experience, it’ll be hard to notice any difference. It’s cool for the other players to look at your avatar and when you are in a vehicle, but it’s not like you’ll be paying close attention to your driver when the surface of Elpis is littered with creatures to kill and things to blow up. The colour coding of items and weapons that have been dropped is always a nice touch, this way you can sift through the battlefield and ignore certain colours when you don’t need any. Weapons have different colours on their tier. White being the lowest followed by green, blue, purple and finally orange. Music wise the game is abstaining. This doesn’t mean that there are not audible cues. When your active skill is off cooldown you’ll hear a beeping noise. Different guns make different sounds, depending on their elemental damage and effects. There’s ice that shatters which really is a nice sound. The voices of the Scavs (bandits) feel borrowed from the previous games, so be prepared to hear a lot of crazy whooping and burly voices. The game is intent on keeping you moving and making sure you understand the mission. There are several points in the game where your objective will be broadcasted to you to the point of being slightly annoying. When you are trying to loot you don’t need to hear that you need to open a door five times a minute to understand what to do to continue the narrative. Borderlands: The pre-sequel is still a solid action adventure roleplaying shooter. Like the former games you can choose out of four mercenaries, each with their own playstyle. Athena the Gladiator: A former Lance Assassin turned mercenary and armed with a versatile Kinetic Aspis shield. When leveling up you can learn skills which lets you charge up the shield the more you are being shot at, using it as a boomerang to kill enemies. Wilhelm the Enforcer: A Hyperion engineer with a predilection to upgrade his own physical form with robotic parts. His active skill are two drones which help you. One shields you from damage and the other goes around shooting the place up. Nisha the Lawbringer: A gun-waving sharpshooter with a murderous streak. Now she likes her pain. Her active skill gives you a boost in damage output on your weapons. Not only damage is boosted but also movement speed, reload speed and critical hit damage. Claptrap the Fragtrap: A Claptrap robot supercharged with an experimental software (malware) package. His active trait is losing it. When you activate his skill he’ll change to another player’s active skill and deal damage, not all of these are equally helpful. Bouncing around the battlefield is the right way to becoming a sieve. The game has come down from the grinding, you can level far more fluently. Story missions can be accepted without fear of being underleveled. Bosses have distinct mechanics and they mix things up from your normal run, aim, gun, hide routine. When you encounter them you’ll notice that you are on their turf and they’ll make sure you know this. Bosses can be difficult, but there’s always the second wind option should a boss or another enemy get you to your knees. Shoot down an enemy before the meter that appears on the screen depletes and you’ll be revived with your shields intact. However, the more times you die in a row, the faster the meter depletes. What is fun about playing on Elpis is the fact that there is little to no oxygen outdoors. Oz kits will give you a certain amount of oxygen which you can refill by stepping on oxygen vents outdoors or by activating terraforming stations. Fire weapons are only effective in places filled with oxygen, but when you are fighting outdoors, you might want to shoot for the oxygen masks of the enemy. When this vent is shattered, they’ll have a damage over time running. This can be increased with other effects like electricity or acid to really take chunks of health off. The atmosphere of Elpis is low gravity, this way you can float further and levitate by expelling air our of your oz kit. You can also use the melee attack to stomp down on your enemies from the sky. Leveling up will give you the choice of choosing perks and advancing them. These will aid you in combat. ‘Badass ranks’ can be distributed. These will give you percentages to certain attributes. Like elemental damage, the chance you’ll land a critical hit, the time it takes for your shield’s cooldown to innitiate, melee damage,… All of these things help you shape the character to your playstyle. If you aren’t a lone wolf and want to have some company around you when you are out there saving Elpis, you can always go with the multiplayer mode and invite people into your game to take down the bad guys. Up to four players can jump in the fray and start shooting stuff. This installment of the game is more of the same in the series. It adds little, but still stays true to its roots. If you enjoyed the previous games, you’ll like this one. The gunfights are fast paced and hectic. A slight polish on a decent game. The implementation of laser weapons and zero gravity make for a very fun variety to the run and gun parts. Whether you play multiplayer or singleplayer, there’s no shortage of baddies to shoot and quests to finish!